Encouraging children to spend time outside in nature can improve their creativity and imagination, classroom performance and academic achievement, as well as their overall health and fitness. 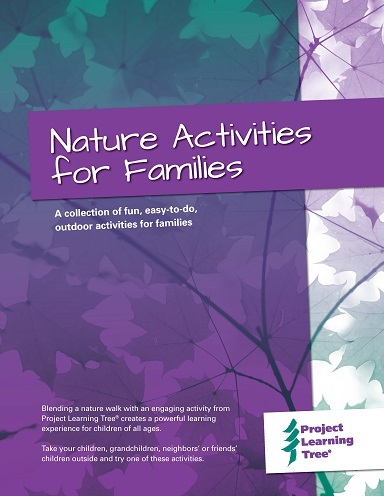 If you’re looking for entertaining and educational ways to engage children or grandchildren in the outdoors, Project Learning Tree’s Nature Activities for Families booklet is ideal. These fun and easy-to-do activities are perfect for parents – and grandparents – to help introduce children to nature in your own yard and local parks. Use PLT’s Nature Activities for Families to take children outdoors in ways that are safe, fun, and full of learning! Over 30 family activities to try while walking in the forest, visiting a local park, or exploring your own backyard. There are also family activities to do around your home, while indoors on a rainy day, or when you just can’t get outside! You’ll discover easy ways to green your home – and save money. Suitable for children ages 3 - 15, some activities work better for younger children, while others are more advanced. The way you present them will change depending on each child's knowledge and ability. Journal pages are included, with room for children to make notes and draw sketches of what they observe.